Quick off the top of your head how many western comedy films can you name? If you got four of them you did pretty well as the list is quite short. You have Blazing Saddles, Three Amigos, Back To The Future III, and Maverick. Now you can also safely add A Million Ways to Die in The West to your list. 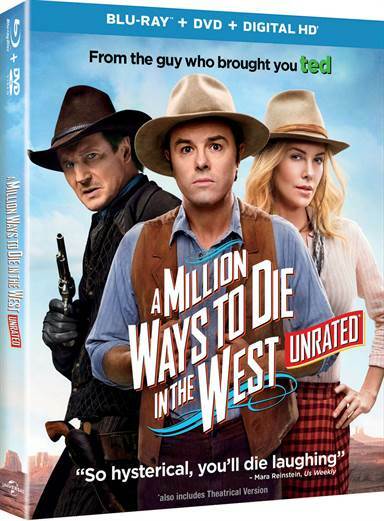 A Million Ways To Die in The West, written, directed, and starring Seth MacFarlane (Ted, Family Guy) occurs during the year 1882 and centers around the town of Old Stump, Arizona. Albert Stark (Seth MacFarlane) a sheep farmer, who is very much out of place and time with the era. His normal daily routine consists of talking his way out of gun fights, complaining about the treatments the local doctor give his patients, and why would anyone be happy in this time period. Albert however is not a loner and has quite a few friends and/or fellow townspeople in his life, including Louise (Amanda Seyfriend; In Time, Red Riding Hood) his ex-lover, Foy (Neil Patrick Harris; Harold & Kumar go to White Castle, Starship Troopers) the owner of the moustachery, his best friend Edward (Giovanni Ribisi; Gone in 60 Seconds, Ted), and Edward's lover, Ruth (Sarah Silverman; Wreck-It Ralph, The Muppets), a fun loving prostitute who is "saving herself" for marriage. Albert's life starts to get interesting when Clinch Leatherwood's (Liam Neeson; Taken, Batman Begins) wife Anna Barnes (Charlize Theron; Prometheus, Mad Max: Fury Road), takes refuge in the town and befriends him. Throughout their many hilarious adventures together they become extremely good friends and Albert now finds a purpose to live his life. As with most film plot structures there always has to be a protagonist, and Clinch fulfills that role easily becoming the major obstacle in Albert's life he needs to overcome. As one would expect from the creator of Family Guy and Ted this film is full of various hijinks, great one-liners, and vulgarity that might offend the Bible belt states of America. The acting is top notch with everyone playing their roles up as far as possible. There are also some great cameos throughout the film, including one that might possible blow your mind if you didn't know it was coming. The Blu-ray set of A Million Ways to Die in the West boast an amazing picture encoded with AVC 1080 and 2.40:1 ratio. The shots have very well defined images and field of depth. Not to be overshadowed by the video quality A Million Ways to Die in the West has a lossless DTS-HD Master Audio 5.1 that even lets you hear the tumbleweeds rolling down the street. Unfortunately, the set is lacking in only one area, the special features. Nowadays it seems like this section of the Blu-ray is an afterthought since the movie market has moved away from collectors to just casual viewers. There is a 10 minute fluff piece on the making of the film, a gag reel, and a showcase of where all the cameos can be found. One aspect of the film set that I applaud Universal with is the fact you have the choice of an iTunes digital copy AND an Ultraviolet digital copy, something a lot of studios are not doing anymore. If you are in the mood for good time and don't mind Seth Macfarlane's humor A Million Ways to Die in The West is the perfect way to relax and have a fun time. However, if you are easily offended stay far, and I mean far away, from this film. Download A Million Ways to Die in the West from the iTunes Store in Digial HD. For more information about A Million Ways to Die in the West visit the FlickDirect Movie Database.